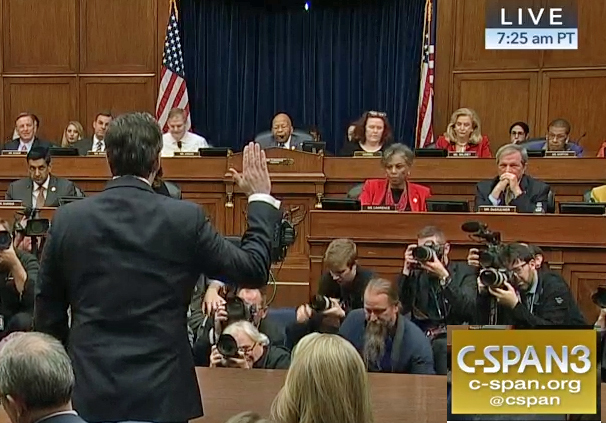 Former Trump attorney Michael Cohen being sworn in by the House Oversight Committee. It was the most dramatic, but certainly not the only negative news washing over President Donald Trump and the White House last week as the Democratically controlled U.S House began to pry into every aspect of his administration, business and political life. Connecticut Sen. Richard Blumenthal, one of the president’s least favorite Democrats, was among those watching, of course, and afterward said he expects Cohen’s testimony will lead to other inquiries and a “Pandora’s box” of other potential witnesses — and pursuit of Trump’s tax returns. At the time of Cohen’s testimony, Trump was in Vietnam trying – without result — to cut a denuclearization deal with dictator Kim Jong-Un. Trump dismissed all of his former “fixer’s” testimony as lies except one part where he said he knows of no collusion between Trump and Russia to influence the U.S. election of 2016. 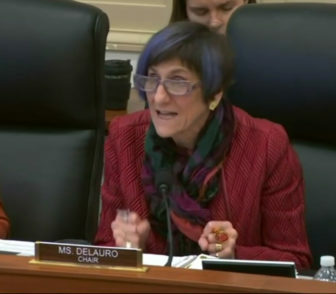 Rep. Rosa DeLauro led last week’s hearing on unaccompanied immigrant children. The turmoil in Washington, D.C., overshadowed other business being pursued by various members of Connecticut’s delegation, including the passage in the House of the first new gun-control legislation in 25 years. U.S. Rep. Rosa DeLauro, D-3rd District, new head of the House Appropriations Committee, began an investigation of the administration’s treatment of unaccompanied immigrant children. The fate of a proposed tribal casino in East Windsor also popped back into the news with a report that a grand jury is investigating whether former Interior Secretary Ryan Zinke broke any laws when he derailed it two years ago. New State Attorney General William Tong also added his weight to a lawsuit challenging the legality of a Trump mandate cutting off federal funds to health care groups like Planned Parenthood that offer abortion referrals. By comparison to the goings-on in the nation’s capital, Gov. Ned Lamont’s efforts to right Connecticut’s financial ship of state seemed, well, normal, as the legislature began grinding the political sausage of his budget proposals. Lamont’s ideas on taxes don’t necessarily mesh with theirs. Melissa McCaw, Gov. Ned Lamont’s budget director, testified Wednesday before the legislature’s Finance Committee. State Republicans may have benefited from Lamont’s post-election struggles. Of the five legislative vacancies created by the governor’s appointments, two went to Republicans in the subsequent special elections. 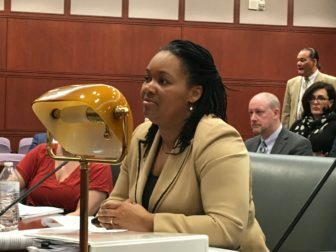 The Republicans also put new budget director Melissa McCaw in the hot seat by asking her to reconcile Lamont’s cancellation of nearly $270 million in vehicle sales tax receipts pledged to the transportation program with the voters’ approval of a “lock box” amendment preventing diversion of transportation funds. A little pressure from a legislator is nothing compared to hundreds of irritated voters, however, and that’s what lawmakers and the governor are getting from their proposal to force small school districts to regionalize into larger ones. There was considerably less voter reaction to a proposal to give residents a way, through the state, to reduce their prescription drug expenses. It was government by name calling and sound-bite rhetoric last week on two hot issues: the president's ties to Russia and, in Connecticut, highway tolls.